Micro-sized living isn’t for everybody, but more and more people from all walks of life are considering it for both short and long-term living. Whether they're young professionals looking to make life work in an area with a high cost of living or homeless people who seek a stable home of their own, tiny homes have plenty to offer. In fact, that’s what Lowe Guardians property management and architecture office Studio Bark hope to accomplish with their new micro homes in London. Large abandoned warehouses and offices are also scattered throughout London, filling up space that could be used as housing. However, deterioration and vandalism often makes these structures more unsafe to occupy than being on the streets. That’s where the SHED project comes in, a collaboration by Lowe Guardians and Studio Bank, to protect these abandoned buildings while providing a temporary housing solution. “SHED” was the name of the project due to its shared landscape, and the sheds are referring to, of course, the numerous micro homes being built in a community. Residents have the ability to easily construct their living space using a drill and hammer, and they’ll have a positive sense of owning their own territory. It’s just as easy to take apart and reassemble in another location, which is great if your work or personal life may take you elsewhere in the coming years. It’s inexpensive, as well, thanks to using only local products. 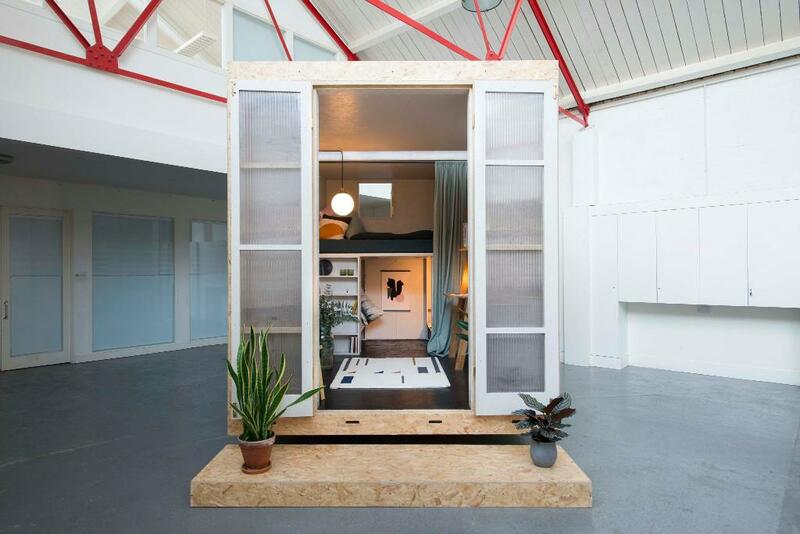 It's estimated that these micro homes can pop up in just a day's work, which is pretty amazing. Lowe’s website description explains that the material used is, “a mixture of Oriented Strand Board (OSB), lamb’s wool insulation, and a small amount of recycled polyester.” The material used, like the wool insulation, is able to provide a soundproof living experience while also keeping things warm when needed. Inspiration for the project came when trying to find out how to create these massive spaces into small, individual living arrangements. Tim Lowe, founder of Lowe Guardians, told Dezeen that it was “both tricky and time-consuming” to do so in the past. At the moment, focus is on providing short-term accommodations instead of lengthy living arrangements for young professionals. Both companies are hoping that it will scale to providing a safe environment to those in need of shelter, such as London’s homeless and low-income communities.